I am excited to announce my new book, The Prepper’s Pocket Guide: 101 Easy Things You Can Do to Ready Your Home for a Disaster (Ulysses Press) is being published and will soon be available. With easy to accomplish projects and lists, the book is a “how to” manual for anyone who is interested in preparing for emergencies. Geared toward beginners, I included lots of basic information on getting started, such as finding money for supplies, dealing with storage issues, gardening, bulk food storage, food preservation, cooking without electricity etc. If you’re wondering why I have not previously announced the book, I actually wrote it in near secrecy, as I wanted to have a completely finished product before announcing it to the world. One of the reasons I started preparing is I do not like uncertainty, and this applies to my everyday life as well. I wanted to be completely sure the book was finished, edited and ready to print before telling anyone. The publisher has a few advance copies for review. If you have a blog or website and are interested in reviewing The Prepper’s Pocket Guide, please send me an email at apartmentprepper@yahoo.com before Friday, June 3rd. Please include a link to your blog as well as your mailing address. I ask that you post the review on Amazon and on your website. The publisher will be mailing the copies as soon as they become available. The first 10 emails will receive an advance copy of the book. I believe the publisher was looking at mid-June, as far as the schedule goes, however, I am not sure of the exact date. I will keep you posted. Congratulations on your first book and with a great publisher at that! I can’t wait to get my review copy. I checked out the description and table of contents on Amazon and it looks like a winner! Congrats! We’ll probably see it on the Best Seller List…. Great Job! Will it be available in Kindle format? It should be available in Kindle, but I am double checking with the publisher. Thanks for bringing this up. I’d love to review your book new book and am looking forward to reading it. 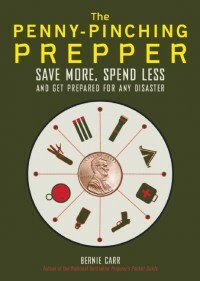 It sounds like a great book to give as gifts to new preppers as well as providing some useful tips to those who are prepared. I am thrilled for you and the publication of your new book. I would like to suggest that you encourage your publisher to promote your book to public libraries. With the lousy economy, there are many people who can not even afford even $10 or $12 for a book. Best wishes for a successful launch! Good idea, I will mention public libraries to the publisher. Thank you! If you’ve got any left, I’ll give it a read and write a review. Sounds like something I need to add to my professional library. Will add to my list. Congrats on being published. Congratulations! Sounds like a great book. I’d be happy to review it in either format (kindle or hardcopy).